We recently began working on a number of lead lights and casement frames at a period domestic residence in Hoghton near Preston. 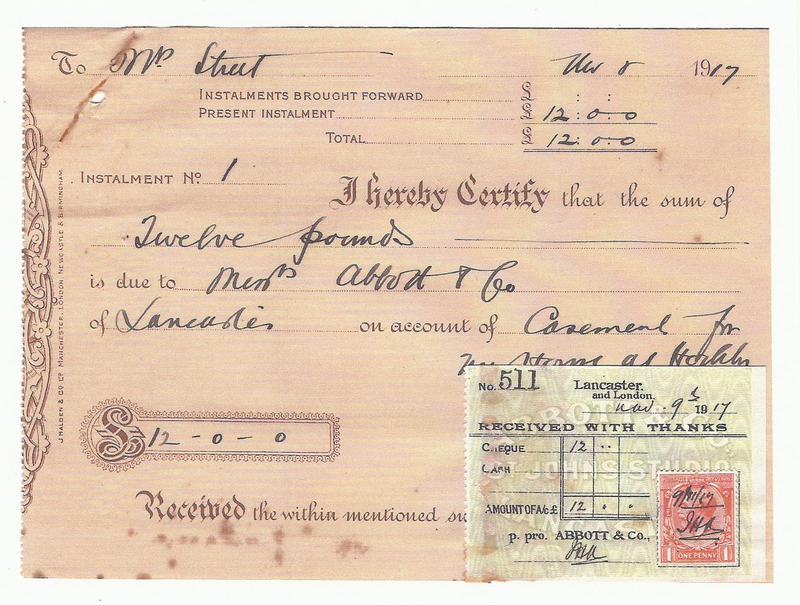 Having completed the de-glazing, our client was kind enough to present us with copies of the original invoice and receipt documents she had managed to unearth. 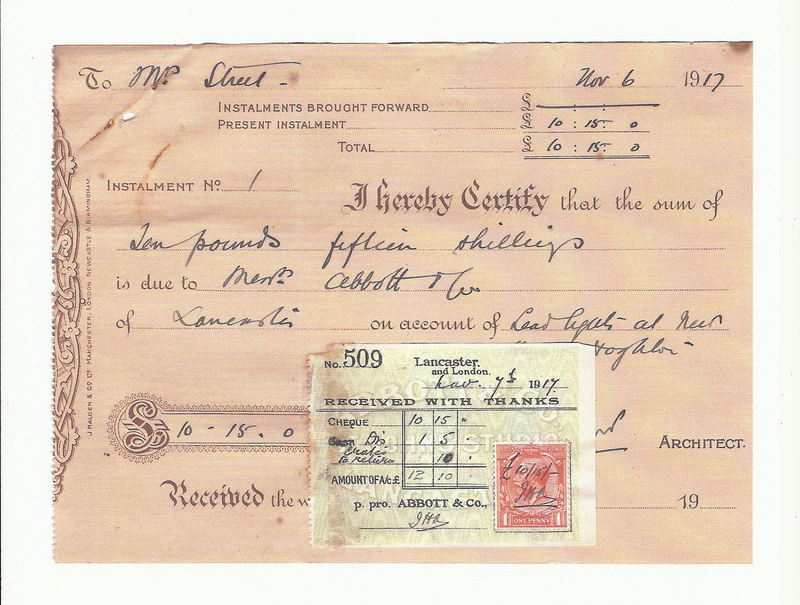 Dating back to August 1917, the original bills were issued by the well known Lancaster based lead light and stained glass craftsmen Abbott & Co. As detailed in the documents the production & supply of 25 rectangular cylinder glass lead lights and a number of metal opening casements came to a grand total of £22.15 (an equivalent of around £1,800.00 in today’s money). The windows would most probably have been transported via train from Lancaster to Hoghton Station and installed by a local tradesman. 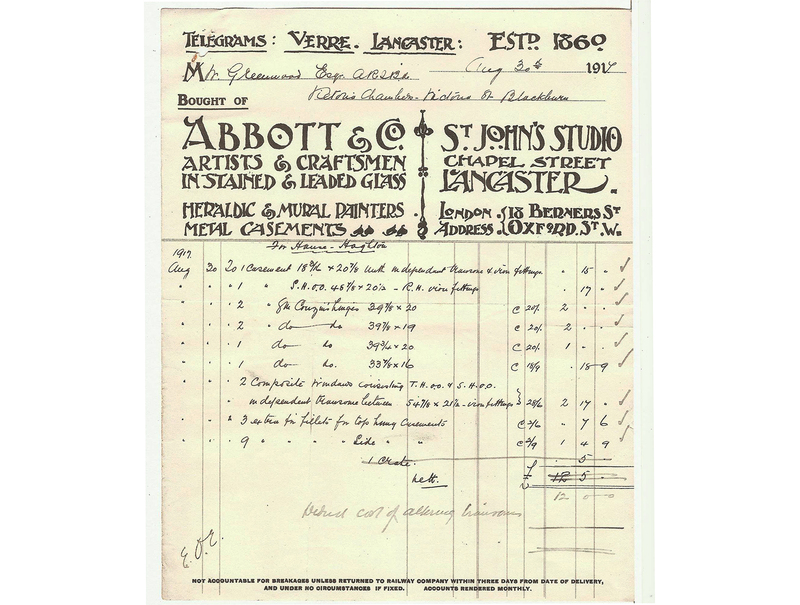 Abbott & Co were established in 1860 by William Abbott. Initially plumbers and glaziers, the company diversified into stained & leaded glass and along with the other renowned Lancaster studio Shrigley & Hunt, became one of the pre-eminent northern stained glass companies of the early 20th Century. Examples of their ecclesiastic work can be found nationally and internationally with local examples at St. Mary’s Lancaster, Rossall School Fleetwood, St. Peter’s Burnley & Trinity Methodist Church Clitheroe to name just a few. The company left Lancaster in 1996 to continue in Fleetwood but have now ceased trading. Lightworks are responsible for the removal, restoration and re-installation of 4 of the leaded lights including the refurbishment of three of the opening casement frames. All of which are beginning to show clear signs of their 98 years of service. 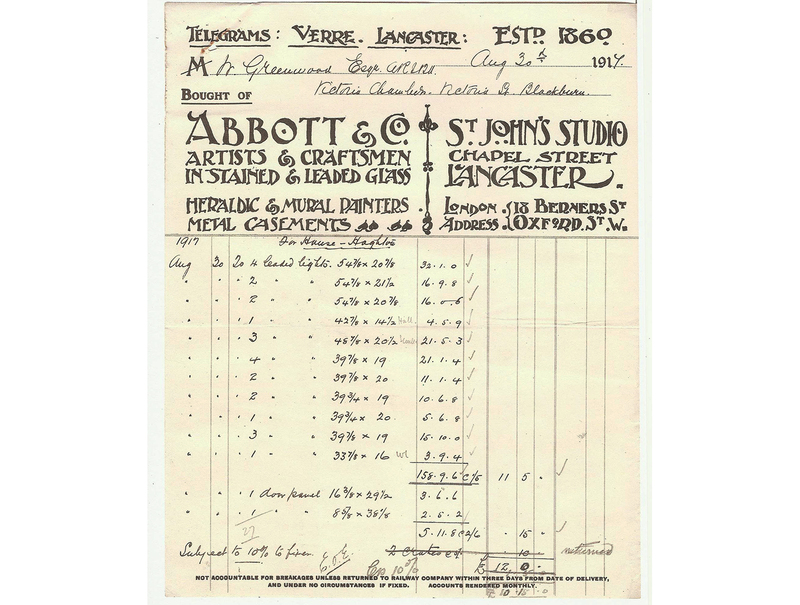 Aside from being a really interesting documentation of social/industrial history, the wonderfully hand drawn and written documents do become poignant when considering that both they and the manufacture/installation of the glass and frames were produced/undertaken while World War One continued to rage.